A couple of weeks back, 50ish of us gathered for the DYM Michiana Meet Up. It was the brainchild of Derry Prenkert, John Keim, and Jeff Selph. Those guys did an incredible job organizing, advertising, and structuring the day. Any good event needs people at the helm and we had some of the best running this one. We started the day out with coffee, bagels, and introductions. There were people there with their team, others that drove in with pieces of their network, and some that came solo. Regardless of your situation, every minister needs friends outside of their context that understand the pressures and joys of church work. As we were going around the room introducing ourselves, you could almost feel everyone breathe deeper — it was obvious early on that we were surrounded by our tribe. There were six DYM Ambassadors present for this gathering. That might not feel like a lot, but I think there are only 15ish nationally, so it was a pretty large representation. Peppered through our time together, the ambassadors all spoke briefly to the group about the piece of DYM that we love the most: Membership, resources, DYMU, the Student Leadership Conference, Podcast Network, and Facebook community group. The underlying current of those mini commercials was trying to convey how DYM wants to be behind us, prompting and encouraging the kingdom work in our context. We also spent time in open-source sharing. If you’ve never experienced that before, those are facilitated conversations that hopefully everyone in the group contributes to. We had two timeslots with six conversations going at tables around the room covering a gambit of topics. Seriously, there was something for everyone. I wish I could have pulled up a chair to all 12 conversations throughout our time together. There were practical ministry ideas, new strategies, and an emphasis on rest, balance, and self-care. Our time together was both personally restorative, fostered new networking connections, and gave us some ideas to roll around in our brains. We ended the meeting portion of the event with Doug Fields. If you’ve never had the opportunity to spend time with Doug, just know that his heartbeat in ministry is encouraging and edifying youth workers. That’s what he did as he spoke for a few minutes to close out our time together and continued to do at the lunch we headed to after. I actually had to send the waitress after his order because he was wandering around the restaurant making sure every youth worker felt known and valued. He’s a class act (blogmaster, don’t let DF delete this paragraph). I can’t speak for the room because we were at random tables, but lunch was my favorite part of the day. I got to sit with old and newer friends and talk about life and ministry. We even dreamed up a few ideas for ministry and future DYM resources. On a personal note, I got some very wise counsel from people that know youth ministry and understand how I think. Moments like that can be rare, so when they come around, we should pay close attention. It was such a valuable day. 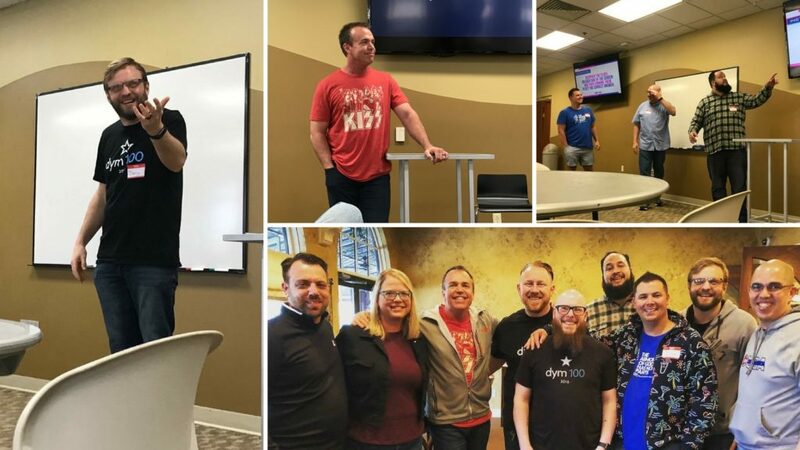 Whether it’s a DYM Meet Up or another kind of network gathering, prioritize getting connected to the larger youth worker community. You are not alone (and this is coming from a female youth pastor with a church next to cornfields)! Meet our tribe. Jump into our Facebook community. Grab coffee with the person at the next church over. Organize an event. People that stay in our profession for the long haul prioritize a youth worker family mentality. Your future tribe might just be waiting on you to invite them to a conversation.